In 1990, Eddie Van Halen proudly announced the first official electric to bear his name on its headstock, and the Music Man EVH Signature subsequently took the rock world by storm. It truly was an incredible guitar and although Ed decamped to Peavey less than five years later, the design – albeit with a few minor refinements and a name change to Axis – was retained and has remained part of the company’s catalogue ever since. 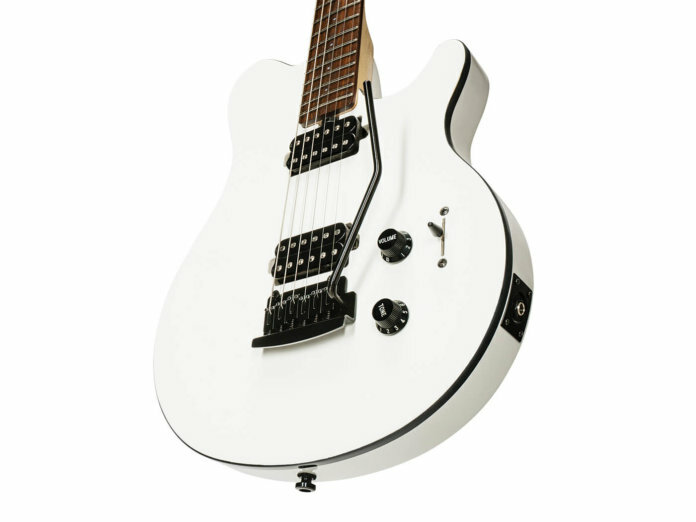 The new version from MM’s more affordable Sterling brand is available in two solid finishes – black and white – and like all three of its current American namesakes, it features a basswood body. The fingerboard is made from jatoba – a dense hardwood that’s also known as Brazilian cherry, and it’s likely that the material will see an increased use in the manufacture of guitars as, not only is it relatively simple to source, it’s also exempt from CITES restrictions. The ‘board’s 12-inch radius is flatter than that of a US-made Axis and the neck as a whole feels almost totally distinct to the birdseye maple necks that have become such a lauded feature of EB/MM’s US instruments. Instead, it has more of a conventional flat D profile than the clubby U-shape found on many other Music Man guitars. This isn’t a criticism, however, especially bearing in mind the significant difference in price (the Axis Super Sport starts at £2,399), and it plays nicely regardless. Pickups comprise a pair of body-mounted humbuckers and hard rock and metal styles are provided with sufficient cut and rounded depth to please. Single notes are gratifyingly full, too, and there’s only a barely perceptible loss of high end when backing the volume pot off. The five-way switching allows for some unconventional combinations to enter the fray, as has always been the Axis’s wont. 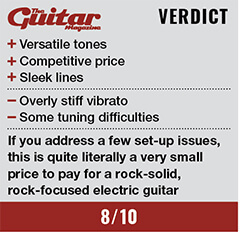 We’re particularly enamoured by position two, which combines the inner coils in parallel to result in a tone that’s part out of phase Strat, part Tele middle position, an option complemented by the neck HB that gives an almost P-90-like warmth-to-twang ratio when used cleanly. Overall we’re impressed by the AX3S’s tonal versatility. The vintage-style bridge is set flush to the body so offers just downward travel, and while it’s great if all you need to do is dump the bar, it’s a bit too stiff for much else. It’s also worth noting that the strings, especially the low E and A, can get stuck in the nut when coming back up to tension after doing so, which can throw the tuning way out – it could probably do with some lubrication.